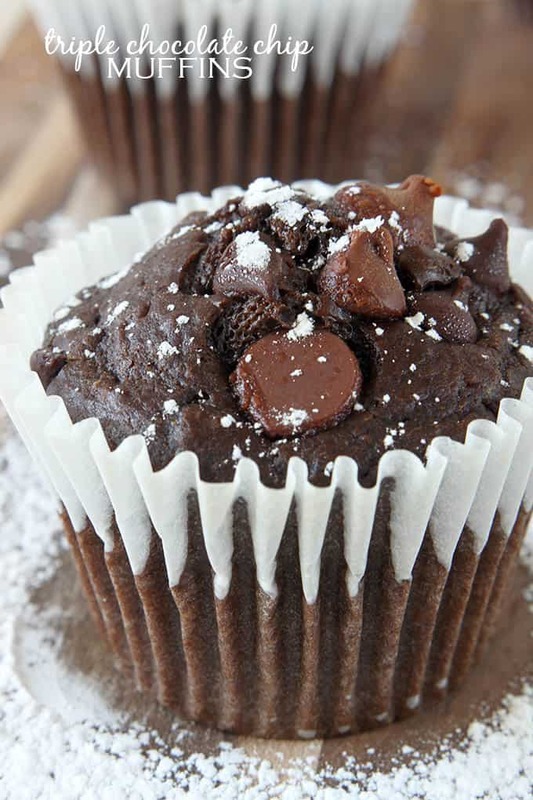 Triple Chocolate Chip Muffins – Rich chocolate-y amazing muffins stuffed with not one but THREE kinds of chocolate chips! I’ll take any excuse to eat chocolate for breakfast. 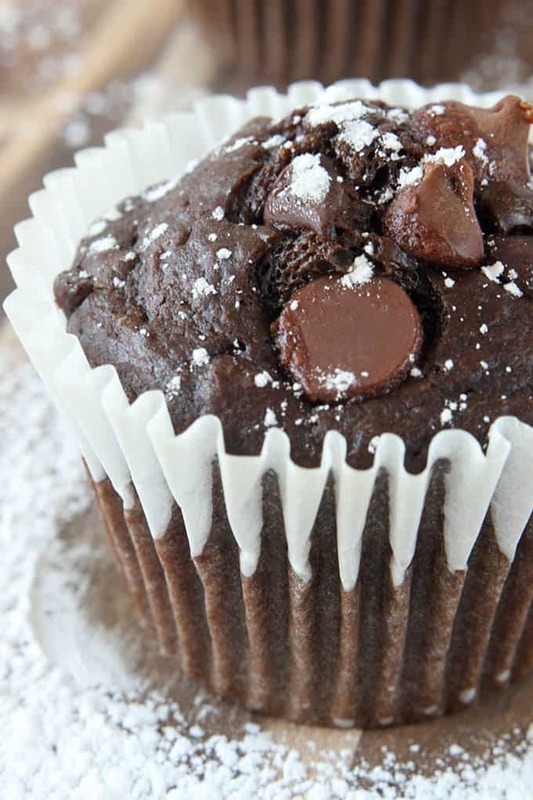 Especially when it’s a big fat rich chocolate muffin with not one but three kinds of chocolate chips. Along with a few other traits (like stubbornness and perfectionism) I inherited my chocolate obsession from my father and chocolate always has, and always will remind me of him. You know that strange phenomenon where someone says they like or even ‘love’ something, and then you see it ev-er-y-where? For example, if you meet someone who mentions in passing that they collect pink flamingo things, suddenly you will see pink flamingos all the time, everywhere you go. And then for every birthday you feel like it’s your duty to get them something pink flamingo. My mother is especially good at this. Once I said I loved cashews and before I knew it I had cashews coming out my ears. I also went through a Tinkerbell phase about fifteen years ago. Still get Tinkerbell stuff for every holiday and congratulatory event imaginable. Careful what you tell people you like, you just might get it. For-e-ver. Well we seem to do this same thing with my father and chocolate. Every Father’s Day and Christmas he gets chocolates in every size, shape, and flavor imaginable. He seems to still love it (but maybe that’s what he thinks when he gives me Tinkerbell stickers…) so we keep giving to him. Anyway, these muffins are sort of in his honor. 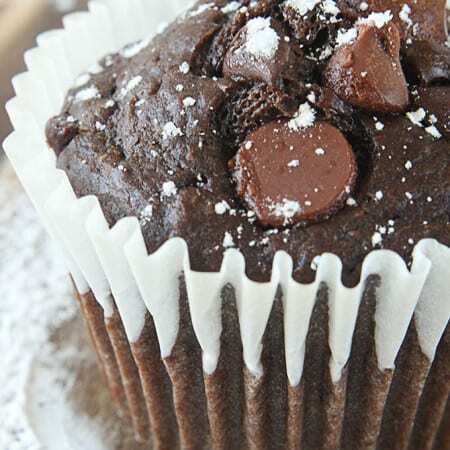 Thick chocolatey muffins with three kinds of chocolate chips, traditional semi-sweet, jumbo milk chocolate, and mini semi-sweet. They’re rich and soooo chocolatey. My husband actually asked if they had pieces of fudge in them. No… but you might be on to something hon! In a chocolate mood? 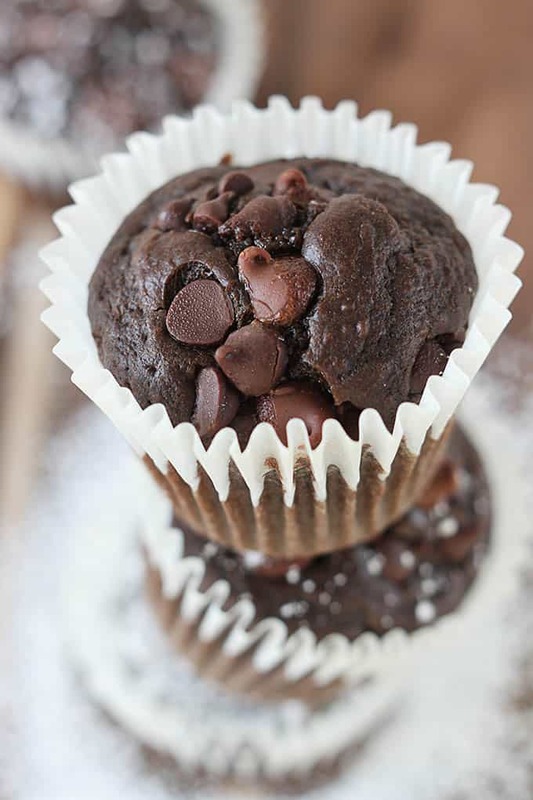 Whip up a batch of these no-fuss Triple Chocolate Chip Muffins! 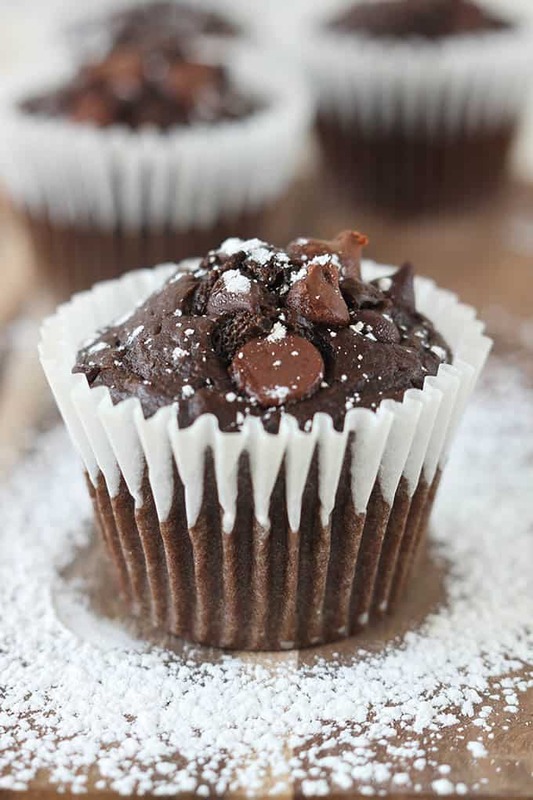 Rich chocolate-y muffins stuffed with not one but THREE kinds of chocolate chips! In a large bowl whisk together flour, brown sugar, cocoa powder, baking soda, and salt. In another bowl whisk together warm water, oil, red wine vinegar, vanilla, egg and egg yolk. Add wet ingredients to dry ingredients and mix until all ingredients are incorporated. Gently stir in chocolate chips, reserving about 2 tablespoons of each kind. Divide batter evenly between the 12 liners, filling each about 3/4 full. 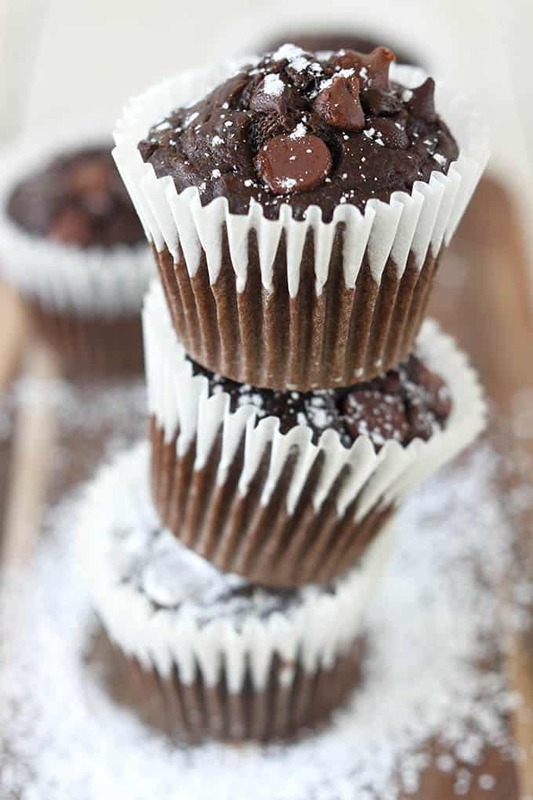 Sprinkle reserved chocolate chips on top of the batter. Bake about 15 minutes until an inserted toothpick comes out clean. Store in airtight container. Holy chocolatey awesomeness batman! Anytime I see anything super chocolatey I must make it, and those look incredible. Thanks for sharing! As a lover of chocolate chips I am wrapped to discover 3 different types here. Red wine vinegar too??? Okay, I’m guessing you’re trying to reduce the sweetness a little. Love the photos you have used. My eyes are very happy. I’m just curious what the purpose of the red wine vinegar is? I don’t have any and I’m wondering if I left it out if it would need replaced with something else. Or if they will be fine without. Hi Trinity, the vinegar reacts with the rising agent (baking powder/baking soda) in order to help the muffins rise. I can’t guarantee the results, but you may be able to try white vinegar if you have that on hand? Otherwise you could try lemon juice. If you try one of these please let me know how they turn out! Good luck! Thank you, thank you, thank you…for adapting this recipe. The original recipe left a lot to be desired but this one is much better and tastes so delicious. Easier to use gluten free flour in this recipe then the original!